Prime Minister Modi was given the ceremonial welcome and the guard of honor in Japan ahead of the delegation level talks on Monday. 1. India – Japan have agreed to a 2+2 dialogue. Includes defense and foreign ministries. 2. Partner ship in defense, health, space and cyber. Japan to invest $2.5 billion in India. 3. India and Japan have signed a $75 billion bilateral currency swap agreement, this will bring greater stability to the Indian economy. 4. Cooperation in yoga and ayurveda, to promote national health scheme. 5. Potential to Integrate Japanese artificial intelligence technology in various ways in India. 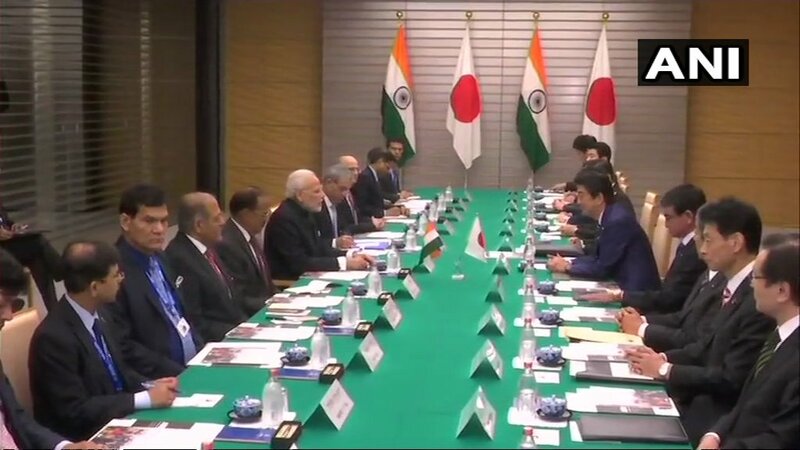 Prime Minister Modi arrived on Saturday to attend the 13th India Japan summit. During the early hours of the day PM Modi attended a community event. He advertised the make in India initiative and called it a global brand. He acknowledged the presence of multiple Japanese citizens working in India.